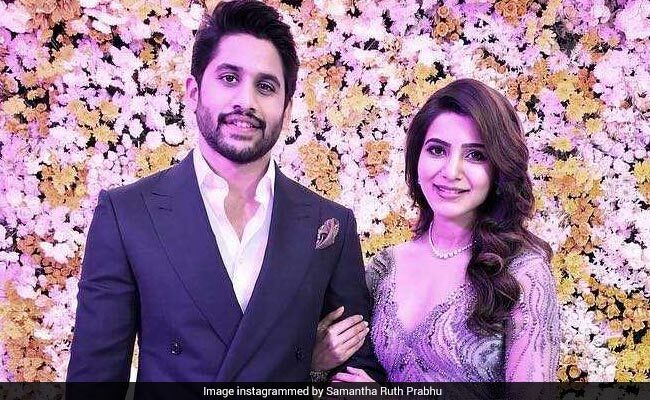 Our favourite star couple Naga Chaitanya and Samantha Ruth Prabhu had their grand reception in Hyderabad on Sunday. The reception was quite a star-studded affair with biggies like Chiranjeevi, Venkatesh, veteran actor Krishna, Ram Charan, Allu Arjun, Rana Dagguabti, Rakul Preet and others. Samantha shared a couple of fabulous pictures from the grand celebration on Instagram. She looked no less than a princess in a lavender embellished gown by Falguni Shane Peacock India and styled by Ami Patel. In one of the pictures, she was all smiles while in the other, the newly wedded couple posed for a perfect picture. Sharing the pictures, Samantha wrote: "And finally wedding season ends. It only took 40 days and a hundred events #grandfinale #perfecfnight #lovemyfamily #forevergrateful #loveyouguys." there is a pic from last night where I didn't have a smile plastered on my face . Shocking !! Other stars from the industry like filmmaker S S Rajamouli and veteran actors UV Krishnam Raju, Krishna and Nandamuri Harikrishna were also spotted at the reception. The Internet was also thrilled to spot Rana Daggubati, who arrived with his father filmmaker Suresh Daggubati. After a fairy tale wedding in Goa, Samantha and Naga Chaitanya took for honeymoon in London. Samantha posted very, very few pictures from their latest outing, sharing only slight glimpse of their wanderings. Samantha and Naga Chaitanya met on the sets of 2010 film Ye Maaya Chesave and fell in love. They got married in October this year, as per Hindu and Christian traditions in Goa. Both wedding ceremonies were held in Goa with family and close friends in attendance.